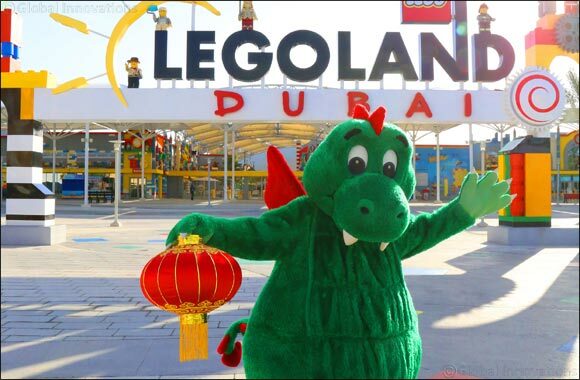 Dubai, 29 January 2019 – LEGOLAND® Dubai, part of Dubai Parks and Resorts, the largest integrated theme park destination in the region, will put the light in ‘delightful’ this February, as it sets the stage to usher in the Lunar New Year with a number of festive activities for the entire family to enjoy. From 5 – 16 February 2019, families can celebrate one of the oldest festivals in the world with rich and colourful activities, right from the moment they step into the park. Walk by the dazzling Factory Street, which will be decked out with Chinese lanterns and red lights – the colour symbolizing good fortune and joy. Building up the fun is an exciting four-meter-long LEGO® mosaic building experience that takes centre stage at LEGOLAND Dubai, made up of over 96,000 bricks. Children can also take part in the time-honored Chinese New Year tradition of the Wishing Tree, where they can write their wishes for the new year and put them up on an awesome Wishing Wall with a LEGO pin. What’s a celebration without food? The restaurants at LEGOLAND Dubai have also pulled out all the stops to create mouth-watering Chinese New Year dishes at the park. Tuck into Hoisin Chicken Wings at Caesar’s Pizza & Pasta Buffet , slurp up delicious noodles made fresh at a noodle kart, or enjoy a sit-down buffet meal with the family at The Market Restaurant. Be sure to stop by any of the family restaurants for fortune cookies and a fortune cookie milkshake! The park is also set to launch its Gold Badge program during Chinese New Year Celebrations. The Gold Badge program incentivizes guests to find the limited gold pop badges worn by LEGOLAND Dubai staff AKA “Model Citizens” in the park. If visitors spot The Gold Badge, it can be kept and added to their collection or swapped for a complimentary day ticket. Pop Badges introduce a whole new adventure to the LEGOLAND Dubai experience. A Pop Badge is exactly that… a badge that pops right on to a lanyard or shirt, so you can proudly wear them once you collect them! All Chinese New Year activities are included with your LEGOLAND Dubai admission ticket, priced at AED 245. Tickets for UAE residents aged 3 and above, can be purchased at the gate for just AED 175 or save an additional 10% when booking online at least 3 days in advance.